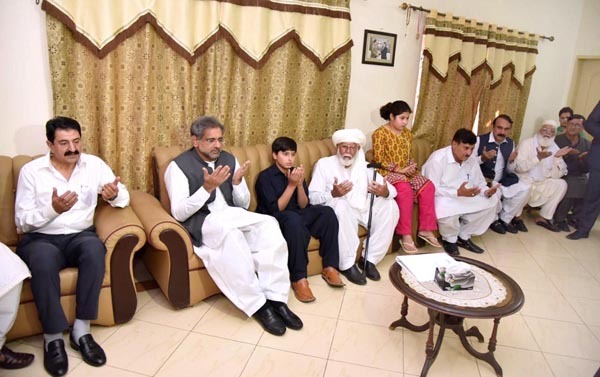 ISLAMABAD, May 21 (APP):Prime Minister Shahid Khaqan Abbasi Monday visited the residence of Colonel Sohail Abid, who was martyred during an anti-terrorist operation in Balochistan, and expressed his condolence with the bereaved family. The prime minister offered Fateha for the departed soul and prayed for patience for the grieved family to bear the loss with equanimity. He said the Pakistan Army had rendered numerous sacrifices to purge the country of terrorism. He said the brave sons like Colonel Sohail Abid were a source of pride for the whole nation.